You ask, just how can Mango Jelly be Accidental? Every cook makes mistakes. Sometimes the mistakes can be useful. Other times you are feeding the rats. The end result was a No-Cook Mango Jelly. Yes, No Cook Fresh Jelly. It worked because the juices in the Mango combined with the fruit pectin while I was waiting for the canning pot to come up to temperature and true to it's name, it "Sure Jell"ed. This time I actually took the mistake, cooked it over a medium heat until it reached 180F, and then canned it. There is a rule of thumb for canning that seems to be apparent. I don't know if it is hard and fast, but it seems to work. Simply put, cook your food so that it attains 180F for a solid minute. Then fill the jars, add to the water bath, and simmer at 180F for 10 minutes. Granted, there are some "caveats" to this. I am preparing fruit jelly that is fully cooked. The jars are all properly sterilized at a full boil. I am at sea level. Actually I am at 15 feet above sea level plus another 5 feet or so for where the pot actually rests if you want to be pedantic. Now, all these warnings aside, I managed to make a thick pudding or a proper "spread on your bread" jelly without cooking. No heat at all. Since no heat was used, you would have to refrigerate or freeze this jelly. Serve as soon as you can. Don't expect this to be something you can leave out at room temperature unless you go through the whole canning process. But... if you want a fruit jelly recipe, or want to make pudding and don't want the bother of cooking, this may work for you. I was shocked when I did this and it made that "accidental pudding" but I definitely will do this again. 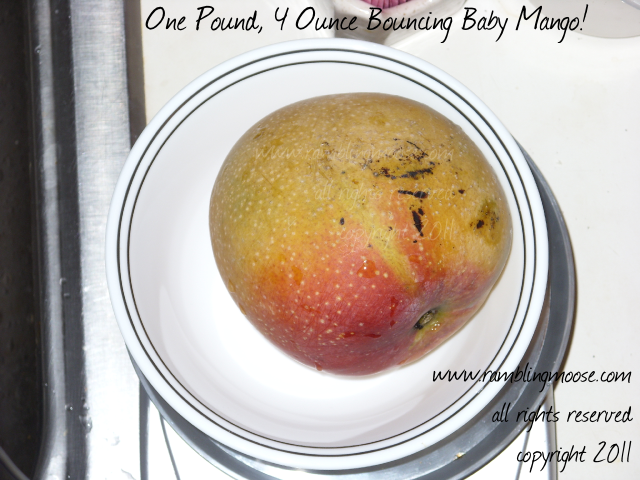 After all, I still have around 20 pounds of Mangoes ripening in the kitchen. 30 ounces or 850 grams of Mango chunks. Just short of two pounds. 1 pound or 450 grams of granulated sugar. 1 packet of Sure Jell fruit pectin. Why the Grams when I live in the US? I prepared this metrically because I was trying to follow a different recipe. I followed it "wrong" and got a strange result. I also made this by weight, so I don't have "cups" for your sugar. Just buy a 1 pound bag, I won't tell. It makes for a sweet recipe, you may want to adjust either fruit or sugar to taste. Add the Mango Chunks to the Food Processor. Add the Sure Jell to the Mango Chunks in the Food Processor. Add the Sugar to the Mix. Blend in Food Processor until smooth. Yes, again. Pour into nonreactive glass jars or bowls. Or into a precooked Pie Crust for Pie. Refrigerate 1 hour or until Mango sets and then serve. You're done. It really is that easy. Think of this as a kitchen "hack". I noticed that you can substitute Peaches for any recipe that Mango is used. For that matter, Banana should work as well. As for the Canned Result? Well that was a story for another day. I will say that when I poured the Accidental Mango Jelly into the pot to heat it, it was thick like pudding, and tasted excellent. Want the Dog? Call the Parrot. You are such a Tsviatok!